Avoid the Interesting / Embrace the Action: Getting Neural with Referral - Adster Creative Inc.
Ah, from this well intended (but uninformed) client question to your agency’s more in-depth assessment of highly segmented and filtered traffic all the way through to lead gen and ROI assessment, the method of analysis and (often) loaded question of ‘solve for x’ can terrify even the most seasoned analytics guru. 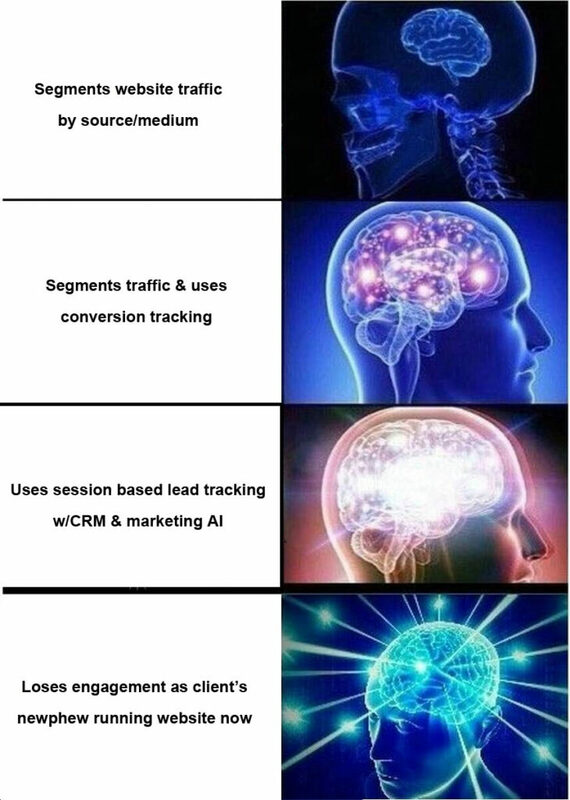 While the above may be our natural response to curiosities, small data anomolies, and any number of inexplicable user behaviour hiccups, it is rarely the case that a client wants to hear us describe the results of their 5 figure marketing engagement as ‘interesting’, ‘inconclusive’, and something that ‘makes no sense’. Indeed, I believe it is our job as internet marketing pros to consider what we’re looking at, and propose an explanation and subsequent course of action predicated on a reasonable hypothesis regardless of how nebulous the data presents itself. I mean, If not us, who? Avoid the interesting, embrace the action! As of late, I’ve taken a growing interest in an oft ignored traffic segment inside Google Analytics – your website’s referral traffic (and more specifically, Adster’s referral traffic). In attempts to stay true to my own guiding principles, I wanted to share 3 insights gleaned from our websites referral traffic, and how we avoid the ‘interesting’ and embrace the action! 1.We win awards without trying! Wow, look at all this referral traffic from (an assortment) of review sites! While some of this traffic is expected based on our internal efforts, other traffic (and awards) appear to be have earned without our knowing. Cool! Understand that the majority of our solicitation comes from Non-north American ‘awards site’ referral traffic (Below), and filter our CRM accordingly. ‘High’er learning anyone? Dad jokes aside, it’s become clear that Jillian’s blog post on Cannabis advertising is a hit! What’s most interesting, however, is the referral traffic sent from this particular education website. O.k, technically not Adster proper, Massagetique is yet another cool project we’re working on internally here at Adster. A site with more reach than our typical SMB customer, the referral traffic generated by this site is interesting indeed. Considered somewhat of an authority on the subject of massage therapy, Massagetique is frequently mentioned in many practioners websites, blog posts that discuss massage, and even Youtube videos! Newsletter campaign that will incent Massagetique’s members to mention us via their website or via a ‘widget’ in exchange for a shout out on our Facebook page. Influencer outreach in attempts to get more prominent Youtuber’s to reference Massagetique in their video descriptions. The above of course are just 3 ways to immediately improve these brands in a vareity of ways from hiring, brand sentiment, and of course, traffic. What are some of YOUR favorite action items gleaned from an analysis of referral traffic? Share ’em in the comments!